Where does one really start when they talk about themselves? I'm Nubia Mejia. A cool kid born in Queens, New York to a Colombian mother and Dominican father. I come from a very humble, crazy place filled with a lot of love. Ever since I was a young girl I enjoyed the arts and anything creative. I always viewed it as the ultimate way to put a little piece of yourself into the world. By the age of 15, I was exploring my creativity by performing at open mics in venues such as the Bowery Poetry Club, The Nuyorican Poets Cafe, and the Apollo Theater (just to name a few) and participating in "Poetry Slam" competitions. I've always enjoyed writing down my thoughts. In high school I took an art and design course that got me interested in fashion. I decided to go to college for Fashion Merchandising, Marketing and Management. After graduating and working in the corporate world for 2 years, I decided it wasn't for me. My position had 0% creative control. I became so bored I started a blog named Nubia's Nonsense. The reason behind the name, is that originally I didn't know if I wanted to blog about fashion or comic books. Though my blog is mainly about style, you definitely see a geeky and very pop culture driven flare on my site. 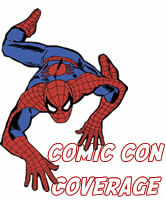 Yes, I do cosplay and cover Comic Con every year! Now-a-days I'm a Social Media Manager. A job I enjoy more because I get to write, be creative and help other people/companies. I've worked with brands such as Swatch Watches, Milk Studios, MADE Fashion Week, Kmart, Style Sip, Sears, Capture This NYC, Independent Fashion Bloggers and more. Through my blog NubiasNonsense.com I've been featured in places such as Glamour.com, Time Out New York, Vibe.com, MTV Style, Wet n Wild Beauty and more in recognition of my fun and funky style. Nubia's Nonsense also had a partnership with Diet Coke for The Heart Truth Campaign as a digital correspondent. It was a great and rewarding experience. I've been lucky enough to work with many brands I admire and it's all been a blessing. My whole blogging and social media career happened by accident... but that's a whole other story. With that being said, you never know where life will lead you. I have made so many amazing friends through blogging and thank you all for your continued support. I want you to feel more confident and beautiful after visiting my site. Life is too short to take everything so seriously. 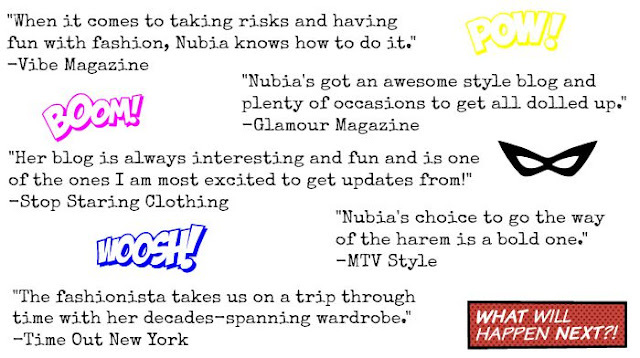 Nubia's Nonsense is a fun place to come laugh, be inspired, and indulge in many fashion and beauty trends. Thank you and cheers my beautiful babes!